It’s back again for 2019! Our annual Troop 500 Fish Fry! Mark your calendars an buy presale tickets now! New for 2019, If you are a small area business looking to be a Fish Fry Sponsor, please see the SPONSORSHIP HANDOUT. Sponsors will be included in the slideshow running over the course of the 2 nights, be present on table tents, have a poster present at the event, and be included in any online advertising the troop does closer to the event. Our scouts every year rely on popcorn sales to help fun our campouts and activities throughout the year. Thank you to the scouts that got out there and sold popcorn and thank you to all those who purchased and are enjoying delicious scout popcorn. Thank you to all of our sponsors that made the 2018 a success for our troop. These funds were used to make much needed repairs to our scout trailer. 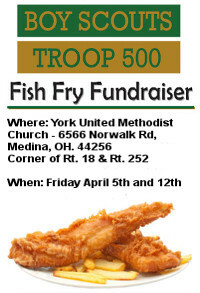 Thank you to everyone that came our to support support Troop 500 and York United Methodist Church this year during our fish fry fundraiser. We served over 300 meals and raised money to use toward future scouting events.